On April 12th the liberal media’s assault on the new English translation of the Roman Missal continued on page 1A of the New York Times in an article written by their long time “religion writer” Laura Goodstein. I’ve addressed the media’s “Global Missal Dissent System” in the past, but at this point their exaggerated claims have become so entirely transparent that it flirts with amusing. Before we take a look at the article itself; first, a general observation. While most people have simply grown used to the idea that secular newspapers, like the New York Times have a “religion desk,” the very idea borders on the preposterous! The notion that Laura Goodstein is somehow qualified to inform the public on the general topic of “religion” is like expecting the kid who stocks the shelves at your local grocery store to dole out meaningful advice on how to grow rice. For the record, I’m an equal opportunity skeptic — I no more trust her spin on Sikhism than Catholicism. Now, I don’t mean to besmirch Ms. Goodstein personally; I only wish to point out that the existence of her job alone suggests a starting point of indifferentism; the presumption being that all religions are basically equal. In the present case, however, the level of presumption — or more appropriately, presumptuousness — is taken one step further still. You see, the New York Times operates from the position that some religions are “more equal” than others, and it is up to cognoscenti like Laura Goodstein and her editors to help the poor uneducated reader understand how. I laugh at the very idea! That bit of perspective out of the way, let’s now take a look at the kind of commentary that such an enterprise is wont to generate. Seriously? Does she really mean to say two thousand or more? I laugh once again! By Ms. Goodstein’s own count, the Association of Catholic Priests in Ireland (to which she refers) claims a total membership of 450. It can hardly be said, nor is it even claimed, that ACP speaks for each and every member in decrying the new translation. That brings us to Ms. Goodstein’s home-sweet-home where she would have to produce the names of some 1,300 American priests who have “publicly objected that the translation is awkward, archaic and inaccessible” to even come close to substantiating her dubious claim. I laugh unto tears! Now, I don’t know what the atmosphere is like at Ms. Goodstein’s parish (yes, I am laughing yet again) but based on my own experience in speaking with laity, priests and bishops about the forthcoming Missal, it seems pretty clear to me that she is well out of touch with reality. And no wonder, just take a look at some of the “experts” she chose to interview. First up is Irish priest Rev. Sean McDonagh — a self-described “eco-theologian” and global warming activist who claims recourse to “everything [he knows] in terms of theology and anthropology and linguistics” in bashing the new Missal. These are just two of the five dissenting voices that Ms. Goodstein chose to quote, but you get the point. Of the lot only one, Fr. Anthony Ruff, a professor of liturgy at St. John’s University in Minnesota, brings a level of expertise to the table that is comparable to the lone voice quoted in support of the Missal — that of Fr. Rick Hilgartner who heads the Secretariat of Divine Worship for the United States Conference of Catholic Bishops. Fr. Ruff, who states that he “fully supports a new translation,” complains that the problem with the one approved by the Holy See is a matter of “syntax and word order.” Fair enough, I suppose. We’ll just have to see how the implementation goes. I do wonder, however, if Fr. Ruff and others like him in positions of authority have ever considered how irresponsible it is to air such negative personal opinions before the ink on the new Missal is even dry. Don’t they realize that by corrupting the attitudes of the people they are called to serve they risk setting in motion a sort of self-fulfilling prophecy? Then again, perhaps that is the goal. Too complicated for priests to read? Too complicated to be explained to the hayseed laity? Please, this isn’t Mandarin Chinese, Professor. We poor pew warmers can handle it, and I’m pretty sure that you and your brother priests can too. While I’m not entirely sure what Fr. Ruff means by “too complicated” since he doesn’t really say, having had the pleasure of engaging him on his blog I can tell you that he has much to say about the Holy See allegedly usurping the power of individual bishops’ conferences in the work of translating the Missal. Point being, Fr. Ruff has some anti-Roman fish to fry based on a misreading of Sacrosanctum Concilium that has nothing to do with the Missal’s actual content. Unbiased, in other words, he is not – a point of full disclosure that the New York Times failed to provide. Shocking, no? So, what are we to do now that the new Missal is officially on its way? Well, according to the eco-theologian, approaching it with humility isn’t the answer. “What we are asking of the bishops is to scrap this text. I know people are not going to use it. I wouldn’t use it,” he proclaimed! “No one” is saying the new Missal is more prayerful and solemn? Seriously, Father? Okay. 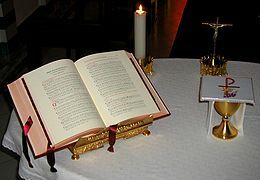 The new Missal is more prayerful and solemn.